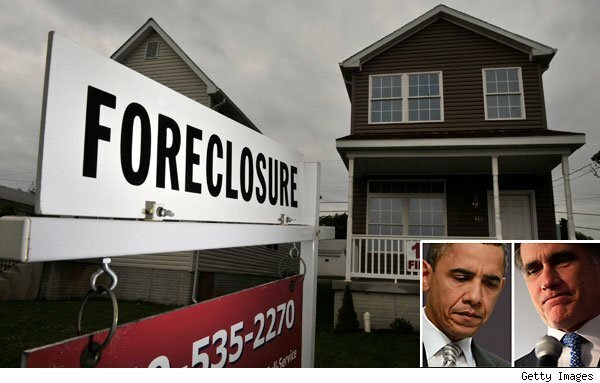 During Obama’s tenure, around 4 million people have lost their homes to foreclosure and 9 million have been served foreclosure notices. There are alternatives that can save homeowners from foreclosure, but federal relief programs that were designed to foster them haven’t fixed the problem. The administration’s flagship relief program, the Home Affordable Modification Program, has helped 1 million homeowners obtain lower interest rates, principal reductions, more time to pay their mortgages or any combination of the three. But that pales in comparison to the 3 to 4 million homeowners whom the program was supposed to help. Meanwhile, the Home Affordable Refinance Program, designed to help 5 million homeowners refinance their mortgages into lower interest rates, has only benefited about 1.5 million homeowners. Recent allegations made by Neil Barofsky, the former inspector general of the Troubled Asset Relief Program, give Obama even more reason to avoid calling attention to these assistance programs. Barofsky claimed in his recent book, “Bailout,” that Treasury Secretary Tim Geithner engineered HAMP to help banks not homeowners. He wrote that Geithner said HAMP was a way to “help foam the runway” for financial institutions. Obama also can’t say that he’s removed systemic risk from the housing system. His administration hasn’t reformed Fannie Mae and Freddie Mac, two government-sponsored organizations that some say are directly responsible for the housing bust. In fact, the two mortgage giants, along with the Federal Housing Administration, wield a much greater influence over the housing market now than before the bubble burst. Though they are now highly regulated, the organizations guarantee about 90 percent of the mortgages originating today. Indeed, partly for this reason, the fate of Fannie and Freddie is a subject that Romney isn’t too keen on bringing up either, said Mark Calabria, director of Financial Regulation Studies at the Cato Institute. The Republican nominee has said that he believes in reeling in government involvement in the housing market. He even commented at a private fundraiser that he might abolish the Department of Housing and Urban Development. But broadcasting an ambition to dismantle government support of the mortgage market could turn off a wide swath of voters whose businesses depend on the liquidity provided by government muscle. Indeed, Romney’s free-market stance on housing, if articulated bluntly, could unsettle many distressed homeowners as well. He has said that he believes that the housing market should naturally “hit bottom,” and has harshly criticized Obama’s relief programs. That outlook jibes with Republican views toward government intervention in the housing market. Only 42 percent of Republicans said that they thought helping homeowners avoid foreclosure should be a housing priority, according to a survey administered by Trulia in December 2011. By contrast, 63 percent of Democratic respondents said it was a priority. Toeing a middle ground, Romney said in a seven-page housing policy white paper that his administration would encourage foreclosure alternatives but didn’t say how. Why? “It’s hard to come up with housing policies that don’t cost money,” Kolko said, adding that such programs also raise the specter of moral hazard. In terms of housing relief, the moral hazard refers to the temptation to default in order to receive assistance, and that’s anathema to many Republicans. Housing experts say that voters can probably expect both candidates to avoid painting a full picture of their housing policy platforms and instead launch into partisan attacks on each other over the issue. Romney will probably rail against Obama’s disappointing relief programs, while Obama may blame Republican obstructionism for the market’s dismal performance during his stay in office. “The most he [Obama] can do is say, ‘I had a bunch of plans and … the Republicans wouldn’t pass them,” Calabria said. Election 2012: Will It Affect Your Decision to Buy a Home?